One day we found ourselves in the town of Pala, which is the last town before heading up the Road to Hana. A former sugar plantation town we found lots of cool shops to stop in and Charley’s for a quick lunch. Charley’s began as a juice stand. Named for their dog, a Great Dane, the restaurant has become a mega for artists, writers and musicians like Willie Nelson who they say stopped in for breakfast one day and has been a regular ever since. Willie Nelson along with other musicians played concerts at this quiet restaurant that is now more a tourist town than agricultural area. 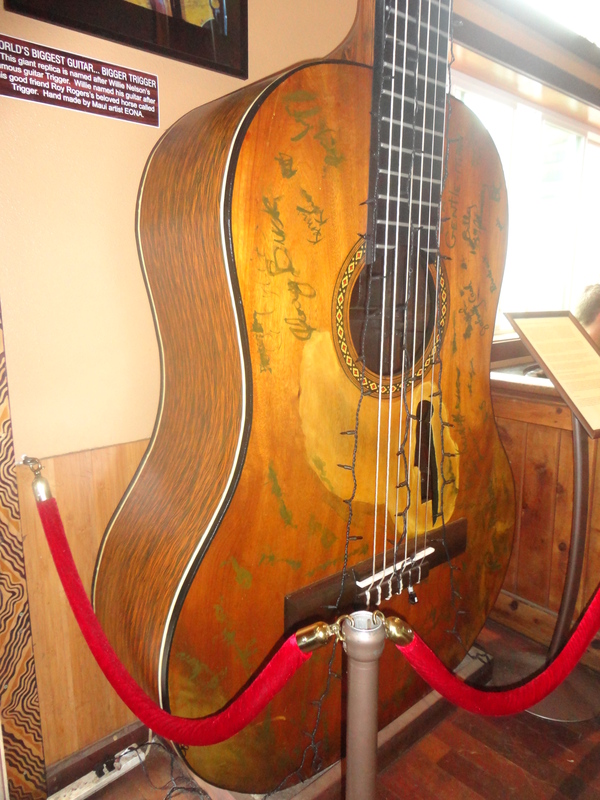 Willy Nelson’s favorite guitar is named Trigger after Roy Roger’s horse. At Charley’s a favorite place to get your picture taken is at the giant replica of Trigger. The beautiful wooden replica was created by artist EONA.